A woman’s wedding day is a not an everyday occasion; it is probably the most anticipated celebration of her life. Now, more than ever, planning a wedding is no cookie-cutter task. The bride-to-be strives to create a celebration filled with unique moments and personal touches that show her individual style. Wedding sites such as BHLDN.com and TheKnot.com have popped up to offer fashion advice, event planning tips, and, of course, wedding dress consultations so that a bride can have many options at hand to make her wedding day glitter with her own personality. After all, that’s what a wedding is all about: the one-of-a-kind moments that make up the big day should be a reflection of the bride and her groom. For this reason, we have worked to compile ideas and inspiration for all you brides-to-be out there. You will find tips on how to plan various aspects of your wedding so that your personality really shines through. And we are celebrating some of those couples who have recited their vows, cut the cake, and gone straight into matrimonial bliss in the past year, because nothing is more inspiring than the real thing. The many details that we include in “The Look of Love” are almost as multidimensional as the bride who stands beside her groom. Here are some unique ideas to help you find the look and feel you want for your own special day. To enter the giveaway, simply visit viezine.com/givies for your chance to win. The contest will close August 9, 2012, and a winner will be chosen August 10, 2012. For more information on Hello Miss Lovely, visit hellomisslovely.com. This first step may be the most important step of your whole planning experience! Try to sit back and think about that one thing that really fires you up. It could be a paint-chipped lantern you found in an antique shop. Or your mother’s lace veil. 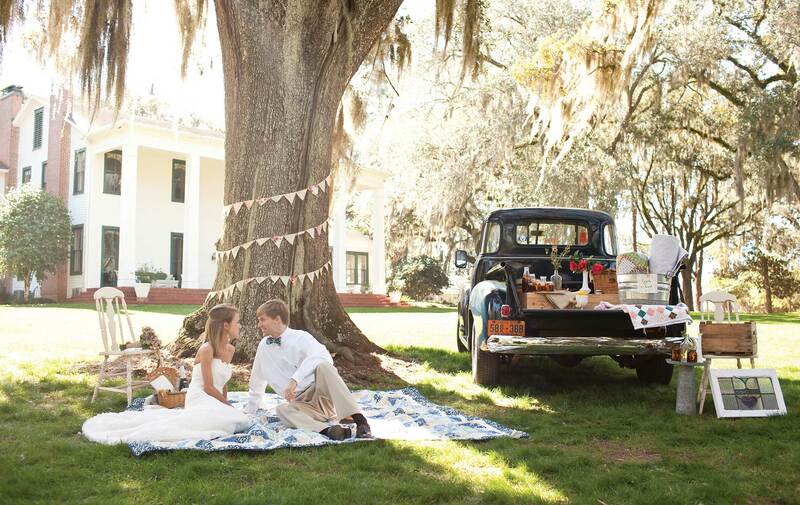 Or you could just know that when you say “I do,” you will be standing under giant oaks dripping with moss. Begin with one piece, idea, or dream and build in other details to complement it. You’ll want to feel comfortable sharing your vision with each one of your wedding vendors, so it’s very important to build a team compatible with you and your fiancé. There should be something about them personally—their work or ideas—that gives you confidence in building your day. If you pick pros with whom you “click,” because you love their portfolios or you just have a good gut feeling, they’re more likely to understand your vision and bring it to life. It’s always fun to give a nod to the wedding location; this is an easy way to personalize your big day. It might be how you set your menu, choose your favors, or set the song list. Even if it’s just one thing, the guests are sure to notice. Tying the knot in New Orleans? A jazz trio to play the ceremony music would set the perfect tone. Saying “I do” in Apalachicola? Treat your guests to an oyster station at the buffet. Not sure what makes your location so special? Pop into the city’s welcome center or log onto its website to see what you can find out! Just as your home should reflect the two of you as a couple, a wedding is a great opportunity to let your personalities shine through. Share bits of what makes you tick—it could be a macaroni and cheese station in honor of a comfort food–loving groom, or it could be as simple as displaying old photographs of your family on their wedding days at your reception. It’s the little details that will set your soiree apart and have guests remembering your wedding long after the last dance. After the bride and groom take the stage and the mothers have a spin, be sure to select the perfect tunes to have your guests dancing the night away. Here’s a list of songs that would get any crowd up and moving. Whether you consider yourself a traditional bride or not, choosing to see your handsome groom before the wedding ceremony will allow for a much more easy-going wedding day. Then you are able to have formal photos with the bridal party and families done before the ceremony, allowing you and your honey to join your guests at cocktail hour. If you desire the warm light at sunset, you can opt to sneak away during the reception for a quick session to capture this perfect lighting. If you insist on not having your groom lay eyes on you until your walk down the aisle, the best way to maximize your time at the reception is to keep the posed photos with family to a minimum. These are images that can be captured either candidly or coordinated at the reception, allowing for more time to mingle with guests and enjoy your well-deserved party. Having a wedding planner present on your big day is a fantastic idea for many reasons, but the help they provide for photography may be the most important. Your planner will coordinate with your photographer to ensure everything is running on time, orchestrate the bridal party lineup, and coordinate the introduction of the new couple into the reception, allowing the photographer to focus on what he or she does best—capture your special moments throughout the night. This is the happiest day of your life, so let that radiant emotion shine through in your photos. Try not to be too nervous or overthink what you should be doing in the photos. There is no right or wrong way, so feel free to move often and modify any poses that may feel awkward or unnatural to you. Be yourself and soak up every minute of the entire day—it will go by in a flash!